It’s hard to believe I am here at 38 weeks. This baby could really come any old time he wants now. And to be honest, I would LOVE it if he came early. This whole pregnancy I have sort of been anticipating an early baby because Oscar was a week early, but I know each pregnancy is different so I am not counting on it. When I was pregnant with Oscar, week 38 consisted of a major snow storm and lots of fun playing hookie from work. This weekend was the 4th of July, so I feel that I must be destined to relax at this stage of pregnancy hehe. It’s hard to tell if I look smaller now than I did with Oscar because I was so bundled up. But just you wait until week 39. I’m gonna hit you with a doozie! I am also starting to have a little bit of birth anxiety. It’s only natural of course, yet I am surprised because I have felt so relaxed until now. I think I just know that it’s imminent now that we are here with just a few more days (hopefully) of incubating. In the past week I really feel that the baby has grown. I don’t know why but things just seem really tight in there. Until now, I have been certain that he is smaller than Oscar. But I am starting to get nervous. Especially with the VBAC on the horizon. A friend asked me the other day if I felt like God was saying anything to me about this birth as compared to the last one. And to be honest, I hadn’t really looked at it from that perspective. I mean I have been praying all along that God would give us the birth that we were meant to have, but it kind of stopped there. So as I was thinking, I came to some conclusions. I think the reason I have been so relaxed this time around is because I know that some things are just out of my control. I can’t control contractions, I can’t control when I will go into labor, and I can’t control what situations may arise. I can manage these things to the best of my abilities and education, but that is about it. And somehow, that realization has been really helpful for me. Nothing about birth is predictable. But that is also the scary part. Giving birth really is an amazing and humbling experience. I am looking forward to it with caution and prayer for God’s perfect will. I do lean into Him because I know that I can find rest in knowing that there is something bigger than me and my pain. I am stealing my friend Martha’s mantra that, “the opposite of fear is faith” and I think it will serve me well. I have faith that labor will start when it’s supposed to, faith that we will be taken care of, and faith that God will give us the birth that is right for our family, whether or not my VBAC is successful. 38 weeks pregnant and down to the wire. If you are the praying kind, I would love all the support I can get as we wait for our new son to arrive! It won’t be long now. Praying for you and excited for you 🙂 God is a very good Father and He can handle whatever happens. I am praying for peace and wisdom for you. For what it is worth, I think you will be amazing! I can’t wait to hear all about it! Sending love and prayers, and you look fab in my opinion!! You look radiant my dear. The baby will come when he is good and ready, however for your comfort with this heat? I certainly hope sooner than later. When people start asking you annoying questions like “Have you had that baby YET! ?” while staring at your feet or looking at your facebook post about how much baby is kicking you, share this website with them…. OMG you are so cute! 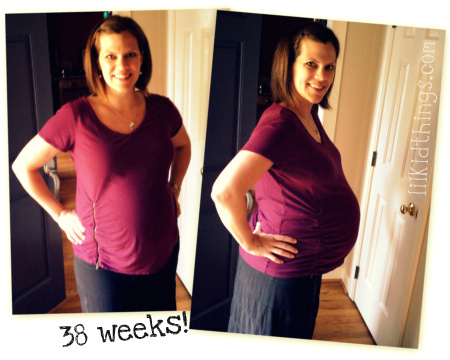 I have to say that I never made it to 38 weeks, so your picture makes me wonder, what would I have looked like. I’ll be waiting on pins & needles to hear the news, and no I won’t ask you if he’s here yet. You look amazing!! My first son was 2 weeks early and I know I was expecting the same with #2 but that little man stayed backing those extra days! I pray for a smooth and easy delivery for you and your little one! Praying for you friend. Wish I was closer!